Most days I’m braving what life throws at me with a travel coffee mug in my hand – I’m mean seriously between little sleep and back working outside of the house I need a little boost in the morning. My sister has always been so gracious as to make me a huge mason jar of this delicious goodness when I most need it! Do you love iced coffee? If so, this recipe is divine and super easy to make. It of course is much easier on your pocket (especially since we’re really cracking down on our budget even more lately). Hopefully you make yourself some and a fellow mama who needs it! In a large container (I used a huge bowl), mix ground coffee with water. Cover and allow to sit at room temperature eight hours or overnight. * If using a large bowl, cover it with plastic wrap and place a kitchen towel over it. Pretty much anything to your liking…get crazy with it! To make iced coffee, pack a glass full of ice cubes. Fill glass 2/3 to 1/2 full with coffee liquid. Add healthy splash of half-and-half or *flavored creamer. Add 2-3 tablespoons sweetened condensed milk or plain sugar and stir to combine. Taste and adjust half-and-half or whatever you are using to your liking. *If using flavored creamer, do not add sweetened condensed milk, use regular sugar. 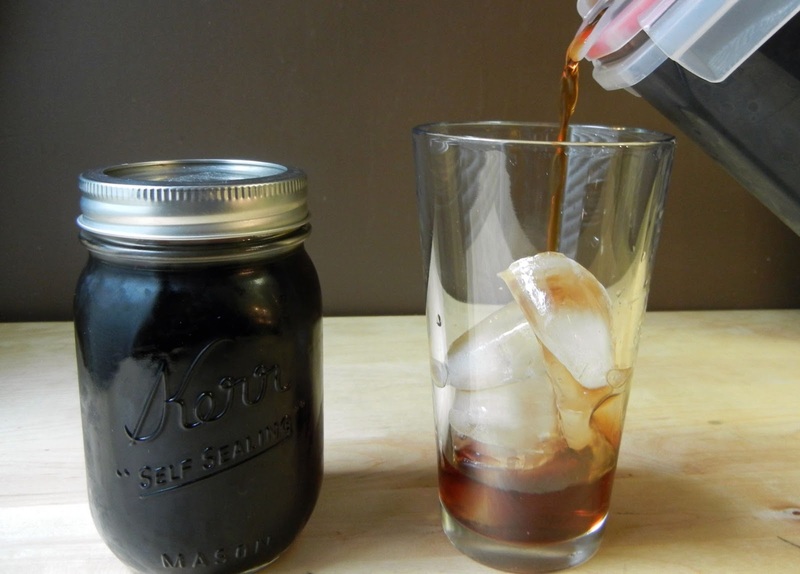 Go here for more information on other ways to make iced coffee concentrate.